Yamaha CS01 Synthesizer, MA10 Headphone Amplifier, MH10 Stereo Headphones and MM10 Stereo Mic/Line Mixer "Before. After. Rolling sound..." Producer Series two-page colour advertisement from page 36 and 37 in the August 1982 issue of Keyboard Magazine. 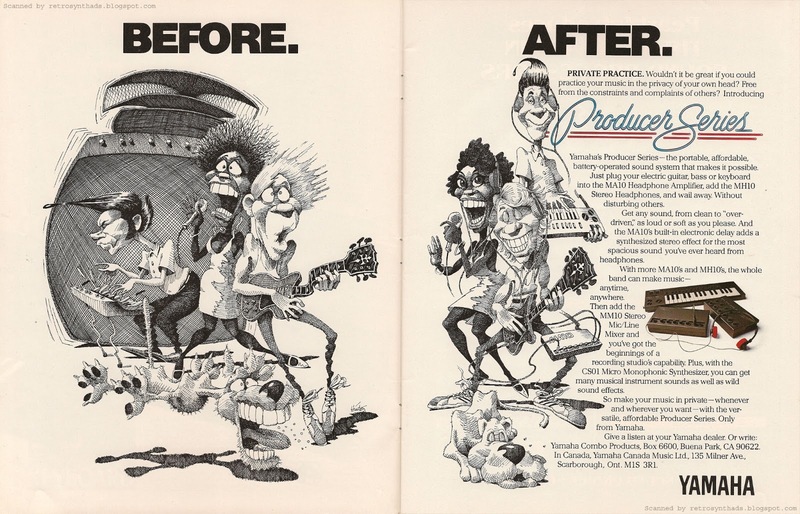 In that first advertisement, Yamaha focused on the theme of "Private practice", where using only Yamaha Producer Series equipment, a band could practice without annoying the neighbours, or apparently, the pet dog. 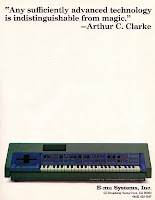 In this second advertisement, again appearing only once, this time in the August 1982 issue of Keyboard, the theme switches to "Rolling sound", aka the ability to take your music on the road. And not on now-fasionable inline skates, but old-skool roller skates - toe-brakes and all. Whether we are talking about the skates or the... ahem... cleavage... it is truly all in the details. Hubba! The point is, this battery-operated gear is light and easy to take on the road. Both this ad and the previous one follow the same "Before/After" layout, with only two splashes of colour to be found. In the "Producer Series" name and the gear itself. Those splashes of colour save the ad in some ways, allowing the readers' eyes to find a focal point. Something that could be rather difficult without the colour in a two page advertisement this busy. I have to give Yamaha credit. They went to great lengths to make these ads unique. And not just the imagery, but the ad-copy as well. 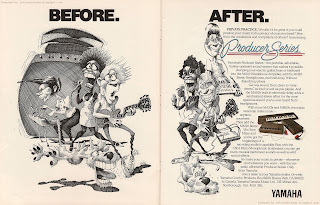 The story pulls each piece of gear from the Producer Series into the ad, even if it is not part of the artwork. Nice. 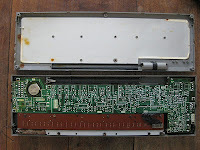 At some point I'll pick up all these pieces just to fiddle with, but as can be seen in my previous blog post, my obsession is really all about the CS01 synthesizer. Anyways, my obsession is really about the CS01. But the others were definitely along for the ride. For example, all four pieces appeared in the same Spec Sheet promo in the May 1982 issue of Keyboard (a month before the ads started to appear). The promo focuses on the most important aspects of each piece - the size and weight. 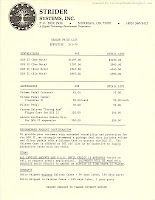 Plus, us historical freaks get some retail pricing info too! "Yamaha products. Four new miniaturized sound reinforcement components have been introduced by Yamaha. The portable battery-operated CS01 Monophonic Synthesizer, is 19 3/4" wide by 6-3/8" deep, with a 32-note keyboard, pitch and mod wheels, LFO, variable glissando, pitch, and waveform controls, pulse width modulation, full VCF, VCA, and envelope generator controls, an octave selector for adjusting keyboard range, and an interface allowing modulation of both VCF and VCA functions by breath. A build-in amp and speaker system is also included. Price is $249.95. The MH10 Headphone Amplifier, weighing 17 ounces and measuring 8-3/4" by 5" by 2-1/16", features four line inputs and outputs, separate volume controls, bass and treble controls, and input and master volume controls that permit intentional distortion effects. A built-in analog delay line can create a stereo-like effect. The MA10 sells for $124.95. The MH10 Stereo Headphones weigh two ounces, and feature adjustable headband and a 9' cable. Price is $29.95. Finally, the MM10 Mic/Line Stereo Portable Mixer weighs 17 ounces, measures 98-3/4" by 5" by 2-1/16", with capability of mixing up to four signals. Each powered product runs on either AC or battery. 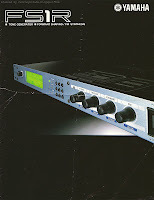 Yamaha, Boxx 6600, Buena Park, CA 90622." $249.95?!?! That's an amazing price for what the portable CS01 can do. And the timing couldn't have been better either. 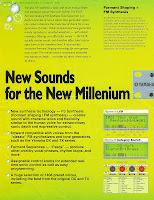 In this May issue alone, we have advertisements for the Roland TB303/TR606 and SCI Remote Prophet. And the article on Jonathan Cain (Ex-Babys Keyboardist touring with Journey) features a large photo of him with an ARP Odyssey strapped around his neck (and looking like he's experiencing severe back problems). Technology was getting to the point where the luxury of portability was starting to kick in. Yamaha was catching the wave. I'm curious though... can I really get a power generator harness for my dog? I could see how that could come in handy. Yamaha CS01 Synthesizer, MA10 Headphone Amplifier, MH10 Stereo Headphones and MM10 Stereo Mic/Line Mixer "Producer Series: Before. After. Private practice..." two-page colour advertisement from page 8 and 9 in the June 1982 issue of Keyboard Magazine. No matter. With life going the way it is at the moment, I have to take any "win" that I can get. And right now, this one is about a 7 out of 10 on the "celebration" scale. Have I built up the suspense enough yet? Probably too much. You see, I recently re-found an old non-functioning Yamaha CS01 synthesizer in my basement. I had originally picked it up so long ago I can't even be sure where I got it. I think it was a freebie that came along for the ride when I locally purchased another synth. I'm sure I had high hopes of taking it in one day to see if it could get repaired, but in the end it quickly ended up out-of-sight and out-of-mind. Fast forward 20+ years later (no kidding! ), I'm searching for a hacksaw blade - don't ask - and this thing literally drops on my head. At least it wasn't a Jupiter 8 that fell on my head... although that would have been worth the concussion. I brought the CS01 upstairs and there it sat on my living room table for a week or so when I finally decided to take a closer look. First I decided to wipe off the decades of dirt with a damp cloth. That took a while in itself. But it looked almost like new after I was finished. Only faint letters written on each key in permanent marker remained. "Fonzie would at times demonstrate an almost magical ability to manipulate technology with just a nudge, bump or a snap of his fingers for things such as starting a car, turning on lights, changing the song selection on a juke box or getting free sodas from a vending machine." So I figured it was time to take out my screw driver and see what was happening inside. It was like one side of the synth had been dipped in water. Ugh. You can see the damage in the close up picture. Cool thing about this circuit board is everything is labelled well. Envelope generator, VCF, VCA, Osc - everything. Very cool. 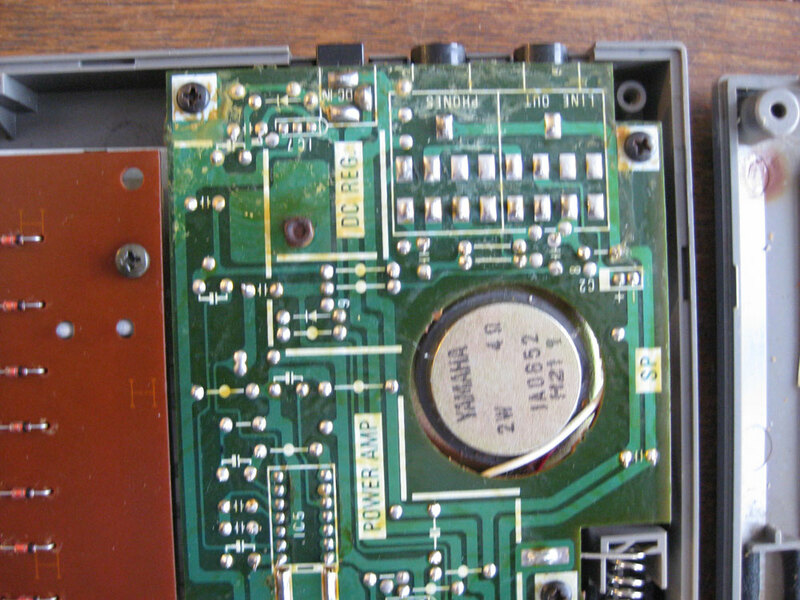 There is even smaller labels indicating inputs and outputs of different functions. Now, please remember - I don't know what I'm doing. I'm not a technician. But I figured if I could at least get it to make a sound then I would know it was probably worth taking it in to get fixed. I unscrewed the keyboard mechanism and everything looked fine. I took a cloth and wiped all the dirt off everything and screwed the keyboard back on. Then, without closing it back up, I plugged it in ... and... noise! And musical noise even! The keys even seemed to be functioning fine. I put everything back together and started testing the controls. Pitch bend and modulation wheels - check. EG - check. Well, kinda. Turns out everything is working except the Glissando (portamento) in the VCO section, and the attack time and release time in the Envelope Generator. All the keys except for the highest and lowest work as well, although they are a little dirty still. So, maybe I do have the Fonzie-touch afterall. Excellent. I look forward to dating twins at some point in my future. All that good news means one thing - this CS01 is definitely worth saving. I'll take it in to my tech along with my Minimoog (which for some reason just konked out on me) sooner rather than later. A pretty good Sunday morning project. As I begin writing this blog post, apparently it's President's Day in the U.S.of A. Because I'm Canadian, I could be excused for forgetting this tidbit of knowledge every year until Facebook friends and Twitter start buzzing about holiday plans. But when I called my Canadian parents this cold Monday morning, who are retired and living in the Southern US through the winter months, they were a little surprised because they didn't realize it was also a holiday these parts. For the longest time there wasn't a holiday in February, which meant having to survive more than two months without a holiday after Xmas and New Years. Yeah, I know... in this cold weather. It really did make for a long winter. Then some genius came up with a fake February holiday called "Family Day" or some such nonsense and the next thing you know, it seemed like every province was scrambling to get in on the action. I have a general hatred of human beings, and that definitely includes families of the Homo Sapiens variety. But if you are going to go and include a day off work, you can be sure I'll bring my shiny gold short-shorts and Keytar on that bandwagon. Point being - just happy to have another day off and planning on keeping this blog post short so I can enjoy the day. Now, I know what your first question is - WTF does family day mean?!?! But, brushing that question aside, I know what your second question is - Is this really a Vintage Synth ad? And it doesn't matter, 'cause the Yamaha FS1R has been one of the only things on my mind lately. Since it came out in the late 90s, I've wanted one. I've craved it. Hurts my liver I crave it so much. But I've never managed to come across one locally. Sure, a month or two will go by when it leaves my mind, but thought of owning one always pops back in to my mind. I believe this sickness is known as GAS (Gear Acquisition Syndrome). And the only prescription is NOT more cowbell. It's slapping down a grand on eBay on the rare occasion that they do come up. Really rare on Ebay Canada. The brochure itself isn't in that great a shape. But again - I don't care. I want one. The green colour even hurts my eyes when I try and read it. But I don't care. I want one. I cut the scans up into six pages rather than two long pages because of the way Blogger shrinks images above a certain pixel size. But I will put up the images of the long images when I get home today. The first thing I noticed when I flipped open the front page was the title - and in particular the word "Millenium". Sure enough it came up as a spelling error when I typed it for the blog post. A quick Google check and... yup. "Millennium". But I don't care. I want one. I could go on and on - but why not just read the brochure. 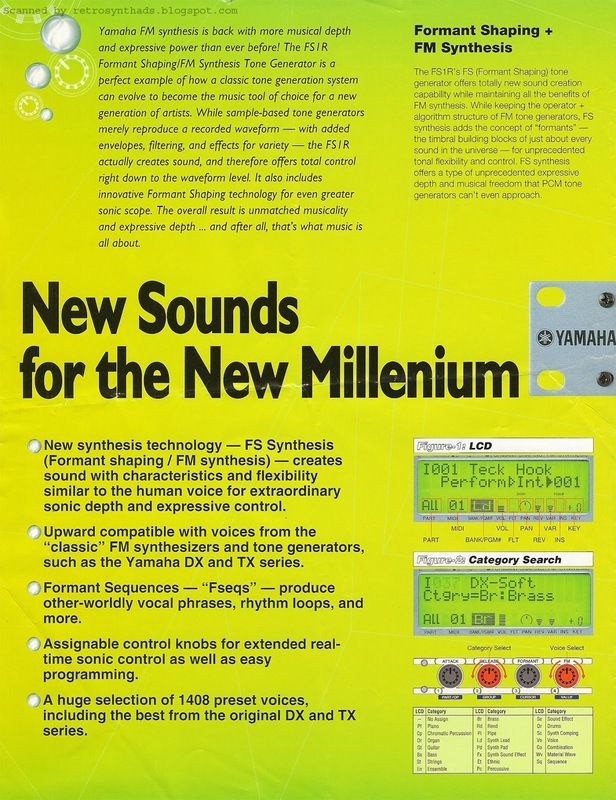 And check out Sound on Sound's detailed review of the yamaha FS1R from 1998. 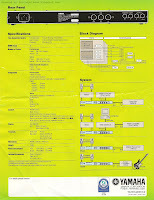 Vintage Synth Explorer's FS1R page includes a few sound demos too. Also, check out this YouTube video of the demo songs. Even simple Google searches make me want this baby more and more each day. 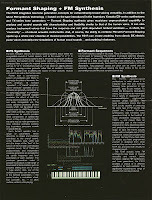 Steiner Synthesizers Microcon vertical black and white half-page advertisement from the left side of page 52 in the January/February 1978 issue of Synapse Magazine. Someone was obviously paying attention. What an improvement over the last version of this vertical advertisement that appeared in the previous issue of Synapse. In that previous ad, you will recall that the dark text was appearing over the top of the dark photo of the Microcon being held by the hairy Wookie. Even the name of the instrument couldn't be read. But all that changed and this might be Steiner-Parker's best ad yet. Correction - Steiner's best ad yet. That's right, Parker has packed up. Finally, with this advertisement and it's tall, vertical format, readers could get up close and personal with the Microcon. Most, if not all of the labels on all those switches and knobs are readable. The ad-copy is also nicely laid out, with the ad-title "Steiner Synthesizers" big and bold. So is the name of the instrument, nestled gently next to the wrist in the photo. And what used to be just big blocks of ad text has been separated into three paragraphs. Much more legible. A branding expert may have wanted them to retake the photo (assuming that newer versions of the Microcon would only have the "Steiner" name on them - and not the Steiner-Parker logo like in the photo. But I'm not gonna get picky. 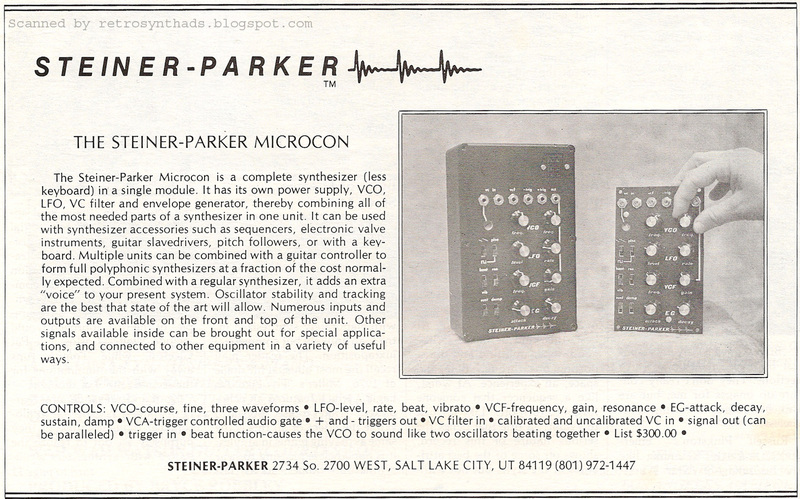 Although Steiner-Parker had chose not to advertise the Microcon or any other SP instrument in Contemporary Keyboard since the end of 1976, just the other day I did notice that it did pop up in the Spec Sheet section of the July 1977 issue. "Steiner-Parker Synthesizer. 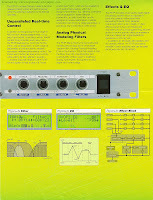 The Microcon features a VCO, and LFO, a VCF, and an AD envelope generator. It is designed to complement other synthesizer by adding an extra voice to them. The unit is about the size of a small pocket calculator in width and height, but is about four times deeper. 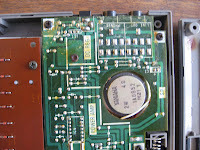 A power supply is built in. Price is $300.00. Steiner-Parker, 2258 S. 2700 W., Salt Lake City, UT 84119." 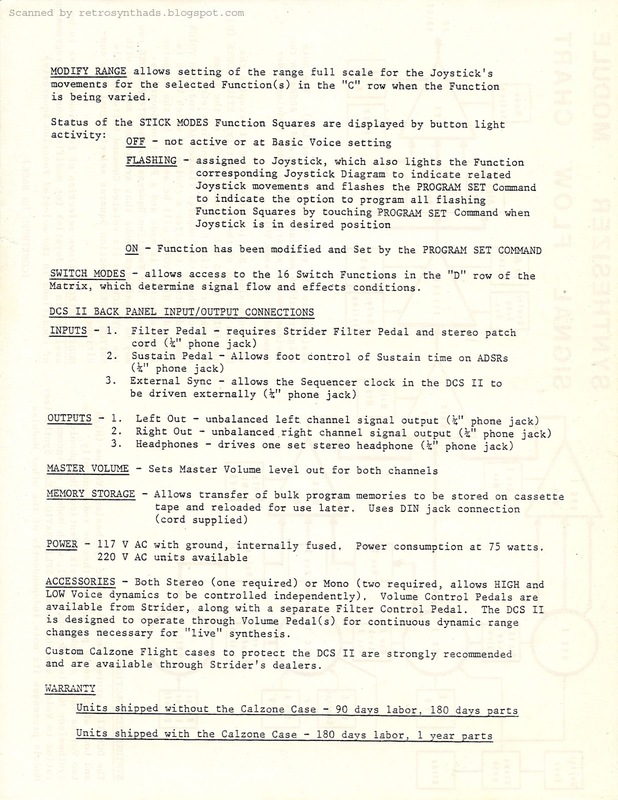 Two interesting things about this Spec Sheet. First - the same summer, a similar promo appeared in the What's Happening section of Synapse, and, as I posted in my last blog post, Synapse also included the promo for the Minicon, another one of their synthesizers. But it didn't get mentioned at all in this Spec Sheet promo. There are some good photos to be found in this July 2008 auction post, this August 2011 auction post, and this follow-up auction from October 2012. Most of the details are taken from the Microcon ads of the day. One other really cool resource I found online was through the electro-music.com forums, where one smarty-pants engineer, David M. Ingebretsen, has created new PCBs for the Microcon. The project seems to have started back in 2011 with the PCBs shipping at the end of 2012. A cool read for anyone interested in that sort of thing. And that thread led me to his own Web site, where he has resurrected a Steiner Synthasystem modular - and it looks fantastic. He has tons of other projects too - you can read his blog here. I've only started to explore these pages... there goes the rest of my Sunday afternoon! 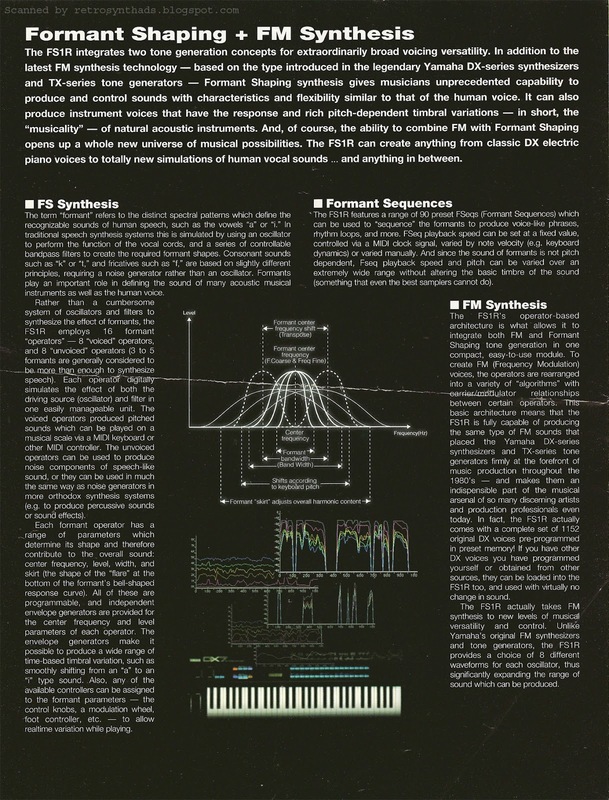 Steiner-Parker Microcon synthesizer vertical black and white half-page advertisement from the right side of page 45 in the November/December 1977 issue of Synapse Magazine. I don't know where to begin. But, in a nutshell - this ad has been given a really good beating by the ugly stick. If you recall from my last blog post, it was only six months previous that S-P came out with this rather lovely, mature advertisement for the Microcon. Fairly good layout, lots of white space, large photo, good font sizes. Obviously a lot can go wrong in six months. Believe it or not, this advertisement contains the *exact* same ad-copy as that previous Microcon ad. But you wouldn't know it, because you can't read most of it. In fact, you can't even tell what product this ad is for. You can't read that either. This is not human error on the part of the scanner (me.... :) This is human error on the part of whoever gave the job of designing the ad to their twelve year old nephew. Could you imagine the damage that kid would have done had Photoshop been around. Two words - lens flares. And maybe it's because I'm follically challenged, but that arm hair is creeping me out a little too. The good news: Steiner-Parker decided to continue to use the waveform imagery in their logo. It's squished in there beside the name a little, but I'm gonna take whatever goodness I can squeeze out of this advertisement. "Utah's claim to electronic fame, Steiner-Parker, has released two new synthesizers. The Minicon (designed to compete wih the ARP Axxe and the Minimoog) features a traditional compliment of modules and the ability to split one sawtooth oscillator to make it sound as two. It retails for $995. The Microcon is the size of a normal module but features the functions necessary to add another voice to an existing performance synthesizer. The Microcon retails for $300." $300 bucks! Impressive. That price would have definitely put it on my radar for purchase. 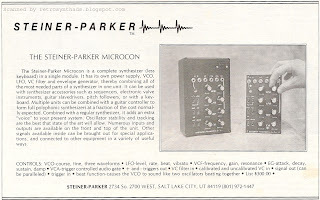 But even more interesting is the mention of another Steiner-Parker synthesizer - the Minicon! I can't recall coming across an ad for the Minicon in the usual magazines, but a quick Google search brings up the Minicon page on Vintage Synth Explorer. For $995 you got a VCO, VCF, VCA, EG, LFO, noise generator, portamento and S&H. Not too shabby. But apparently very rare. 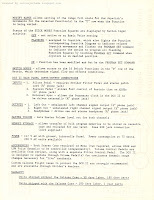 Synthmuseum.com also has a Minicon page with some good info, as well as a scan of what looks to be a sell sheet for the Minicon with a lot more info. Couldn't find a video though. I'll keep looking. Luckily, even Steiner-Parker knew something had gone terribly wrong with this Microcon advertisement, and either the company, or Synapse, decided to fix it the next time it ran. I'll get to that, and more info on the Microcon, in my next blog post. Steiner-Parker Microcon "complete synthesizer" black and white 1/2-page advertisement from page 7 in the July/August 1977 issue of Synapse Magazine. It's been a while since I last blogged about Steiner-Parker. 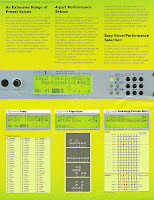 April 22, 2010 to be exact - a half-page advert for S-P's Synthacon and their multi-magazine promotion of a free sequencer with every purchase. If there was one thing I remembered about many of S-P's earlier ads, it's that they had balls. Whether it was throwing in a free $500 sequencer with a $1395 synthesizer or going head-to-head with the King of synthesizers. In my mind they were a scrappy bold company ready to take on the world. But a six-month break from advertising has Steiner-Parker maturing as a company. Out with the bravado. In with the specifications. *A lot* of specs. This new advertisement for the Microcon is *all* business. Reading through those specs today, you realize just how ahead of the game they were. The name of the instrument says it all. This was a micro- or smaller sibling of the big-brother Synthacon synthesizer. And Steiner-Parker managed to package all the basic functions of a synthesizer - VCO, VCF, VCA, LFO, EG - into one compact module. It's a great way for a musician to quickly and easily add to their existing musical set-up while also saving a wack of studio space. Case-in-point - when first deciding to build my own Eurorack modular to keep my Modular Moog company when I'm away on business, I purposely chose to include a Doepfer A-111-5 Synthesizer module to help save space. A VCO, VCF, VCA, ADSR, and two(!) LFOs in one compact module. I loved that A-111-5 module so much that when PatchPierre.Net informed me last year that Doepfer was changing the design due to the discontinuation of the CEM3394 chip, I immediately got my dealer to order another one for me. 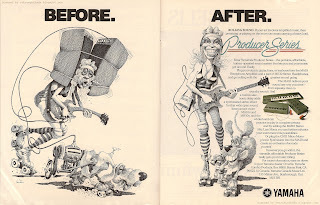 But back to the ad - it wasn't just the ad-copy that matured - it was also the design. It's not perfect, but it is a lot more eye-catching than some of their earlier ones. Font sizes are balanced and we get a generous helping of white space. Everything is there - ad-title, ad-copy, large photo, specs. All grown up. The logo also matured after a brief mid-life crisis. S-P did the adult thing and made the conscious decision to bring back the waveforms image after the name in the logo. They had stopped using those waveforms after the first couple of ads, maybe as a way to save space. But as can be seen in this ad, there is away to fit everything in nicely if you try hard enough. Just feels more like a logo this way. But the best thing about this ad is the photo. Readers see what appears to be two incarnations of the Microcon - a stand-alone version in a nice little case as well as a version that looks like it would feel right at home in a modular system. Reaching in from out of nowhere, the hand looks a little creepy. But having the hand there actually performs two functions. The first is to provide a human element to the Microcon. Now those Microcons aren't sitting all alone and a musician looking at the ad can literally visualize him or herself using the Microcon. The second reason they probably included the hand is to help get across the idea of the Microcon's size. It is about the size of a hand. Itty bitty. Actually - when I first saw the photo with the hand, I was immediately brought back to the late 1970s. But not in a synthesizer way. In a "Mr. Bill" way. Mr. Bill was a recurring sketch on Saturday Night Live in the late 70s, and as Wikipedia puts it, "each Mr. Bill episode would start innocently enough but would quickly turn dangerous for Mr. Bill. Along with his dog, Spot, he would suffer various indignities inflicted by 'Mr. Hands,' a man seen only as a pair of hands". Every time I see this ad, I expect that poor Microcon to suffer various indignities. Giggle. This particular Microcon advertisement only seemed to have appeared once, but there were more Microcon ads to come. Next time! 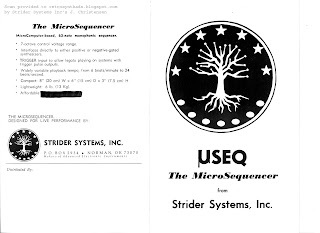 Here are two more Strider Systems Inc. docs to add to the company's recent appearances on the blog. 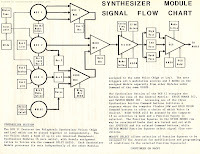 The first document is a two-sided DSC II "Synthesizer Module Signal Flow Chart". 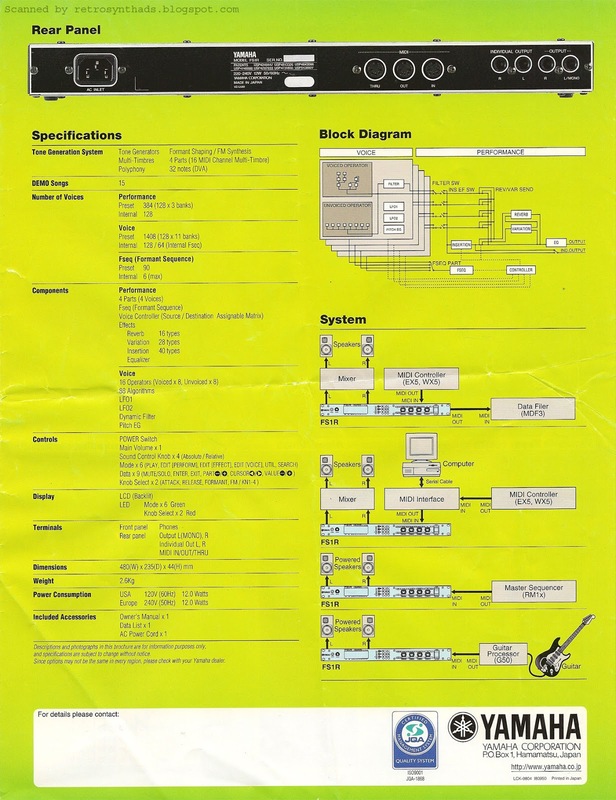 The front is the actual flow chart along with some descriptive explanation of the DCS II's functionality, and the back continues with more functionality information. 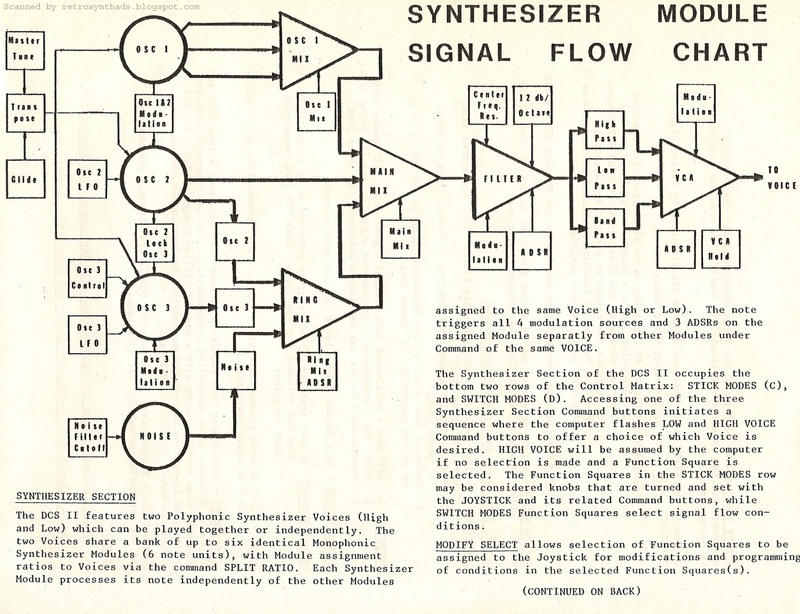 I really dig synthesizer signal flow charts. They are just so much easier for me to digest when trying to figure out exactly what goes on under the synthesizer's hood. Would you rather take a glance at the above flow chart, or read the made-for-a-drinking game DCS II Spec Sheet promo that I blogged about a couple of weeks ago? Okay, maybe a bad example for those that like shots. But you get what I mean. 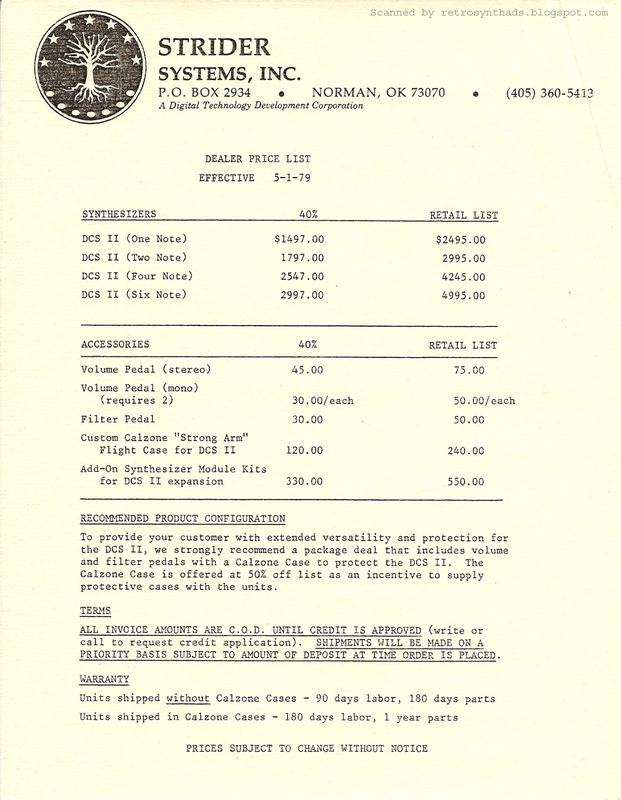 The second document is a one-sided Dealer Price List from 5-1-1979. Either May 1, or January 5. I hate when dates are printed that way. Anyways, I always find dealer pricing fascinating - it's a glimpse into the world of my buddies who worked at music stores in the 80s. A time before the Internet messed with the whole retail pricing model. Stupid Internet. "Rare 'STRIDER SYSTEMS INC.' digital polyphonic synthesizer 'DEALER PACKET' from 1979 NAMM show!! in original 8.5 x 11" envelope!!" So, it turns out that could very well have been part of a dealer packet from NAMM that also included the 4-page brochure that I had already posted. Unfortunately, I have yet to come across the original envelope. That thing looks juicy good. Chicago and was very encouraging. A real gentleman." 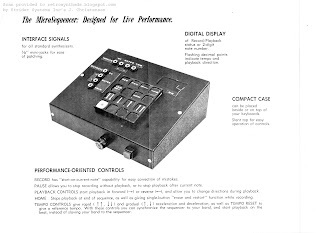 He also remembered an earlier NAMM show where they displayed the DCS-1. "The first time we showed the DCS1 - solid oak case and all - was at a NAMM trade show in LA (lots of posters up on the telephone poles for this new group Tom Petty and the Heartbreakers at the Troubador). I spent a lot of the time in the motel room in West Hollywood fixing the connections that had come loose in the airplane's baggage hold while the other guys were out in the hospitality suites. I was mentioning this to one of the other exhibitors and he remarked knowingly, 'Prisoners of our own devices.'" Tom Petty? Who's that. I kid, I kid. Speaking of musicians, I asked Jim if he had given any of his products away to musicians as promotional items. "I believe that Tony Presti (Anthony Prestigiacomo), a musician from Baton Rouge who became our marketing department, had one - He was the only one who could play it and demo its features convincingly." Those are some good memories. With the resurgence of analog and older synthesizer companies (Moog, Dave Smith, etc), I asked Jim if he ever felt the pull back into synth building. "One thing that the Strider experience taught me was that I am a whole lot better at software than hardware. Whenever I feel the urge to build something that produces music, I do some programming with JavaSound. The only thing missing there is the ability to create sounds from scratch via additive or subtractive synthesis by patching modules together. Massive collections of sampled sounds just aren't the same. I did spend the rest of my career writing standards and building software for interconnecting software modules diagrammatically. Maybe one of these days I'll get around to programming some "function blocks" for synthesizer functions." Thanks again to Jim, who currently heads up HOLOBLOC Inc., for all the great Strider history. I'll still jelis of anyone that was around and contributing to the industry during this time period. Strider Systems Inc. MicroSequencer "Designed for live performance" two-page folded brochure from 1978. I think this is a first. In over four years of posting scans, I don't think I've ever posted a scan that wasn't mine - either through my personal collection, or given to me by some generous interviewee or reader. But I just couldn't resist with this one. If you've been keeping up with my blog posts lately, you know I've been on a bit of a Strider Systems kick and while doing my research I managed to track down then co-owner and president Jim Christensen. 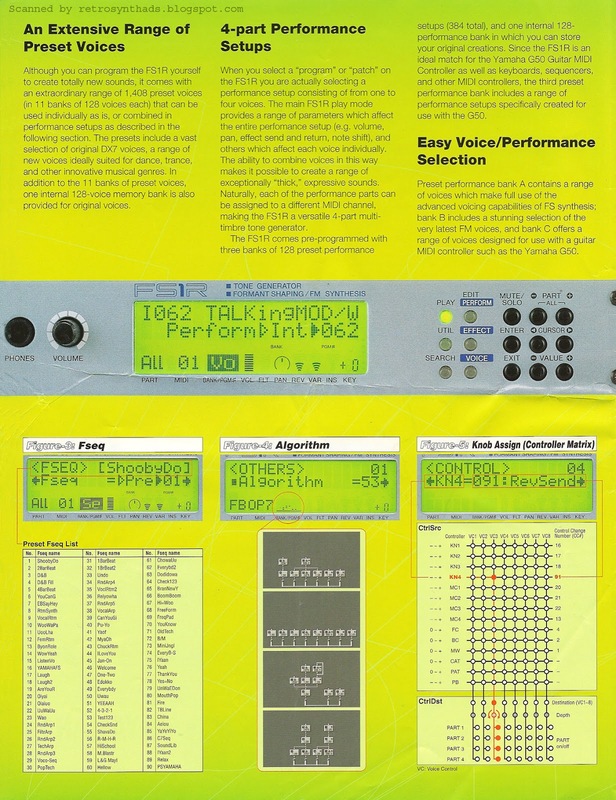 During a follow-up email on the Microsequencer, he was generous enough to provide this scan of the original brochure and give me permission to post. 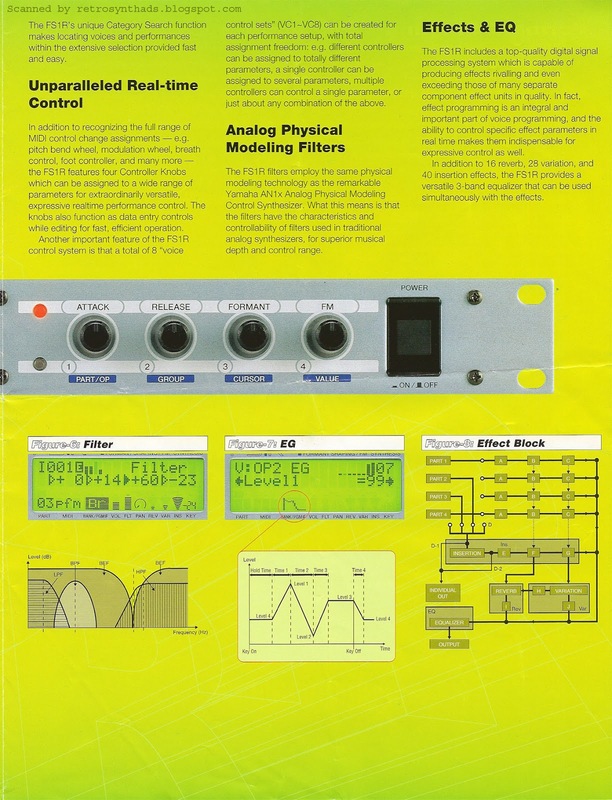 Up until I saw this brochure, I've never stumbled across any other reference to the Microsequencer except the single ad I posted last week. 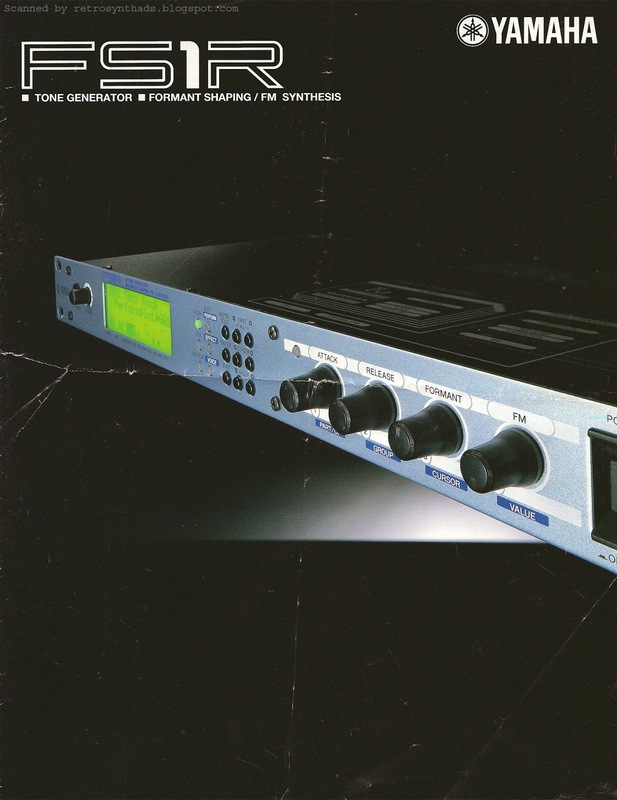 The brochure provides a lot of new information about the functionality of the sequencer, but to me the most important reason for getting this brochure online is that photo. It really helps provide good reference to its size and functionality. 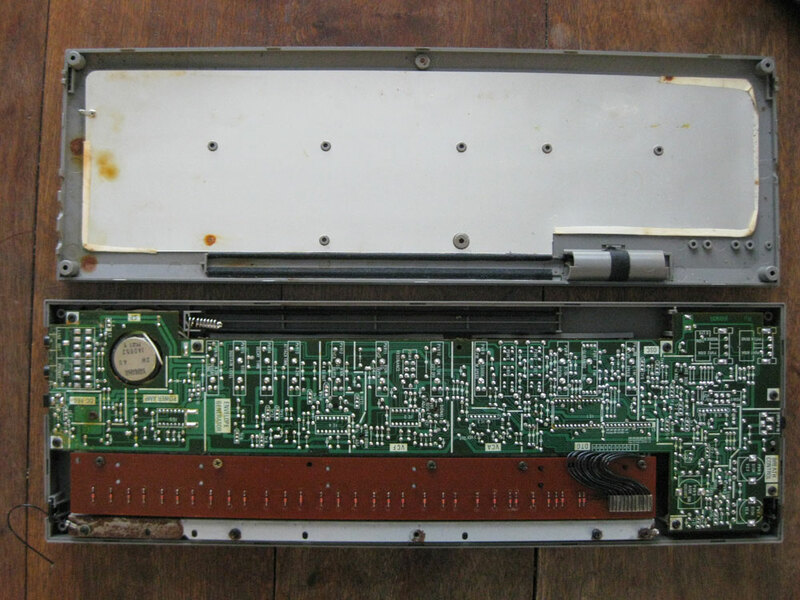 As the brochure states, the Microsequencer came bundled in a "compact case" that could "be placed beside or on top of your keyboards", with a slanted top "for easy operation of the controls". The digital display and the 1/8" mini-jacks further help to put its minute size in perspective.Small indeed. I also love that front cover of the brochure. For two reasons. 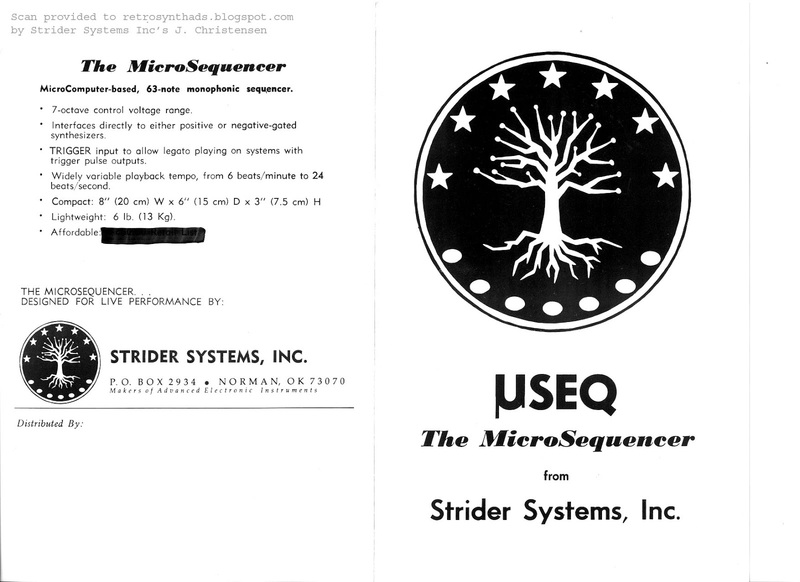 The first is the alternate name for the Microsequencer - " µSEQ ". Using the "micro" symbol just adds to the hipness of this little device. And makes the name as compact as the sequencer itself. The second reason I love that front cover is that HUGE logo. Ever since I first came across the Strider Systems logo, in the back of my mind I've always wondered something. And, quite frankly, I'm a little surprised no one else has commented or emailed me about it. I'm talking about Lord of the Rings. This logo is screaming "Seven stars and seven stones and one white tree". If you do a Google Image Search the resemblance is amazing. And then when you put that together with another LOTR reference - the name of the company: Strider Systems - I start going into full-on geek mode. I couldn't resist asking Jim if the company name was LOTR-influenced. "Yes, it was intentional. Strider (Aragorn of Arathorn) was a big hero of Roy's [Jim's business partner]." So then who designed the logo? "My younger sister (she was 24 at the time). 'Seven stars, seven stones and one white tree.'" "The Lord of the Rings has had a profound and wide-ranging impact on popular culture, beginning with its publication in the 1950s, but especially throughout the 1960s and 1970s, during which time young people embraced it as a countercultural saga. "Frodo Lives!" and "Gandalf for President" were two phrases popular among American Tolkien fans during this time." Even the game Dungeons & Dragons threw in many of the races found in the books "as a marketing move to draw on the popularity the work enjoyed at the time" Gary Gygax was developing the game. And this led many games that were influenced by D&D to carry on these LOTR references into the games of today. How awesome is that. But most importantly, music of the 70s was also influenced by LOTR. Led Zeppelin, Rush, Styx and Black Sabbath. And I'm sure there were more. So, put it all together, and there is little chance that at some point in time a high-tech (*ahem* "geek") start-up synthesizer company wouldn't be influenced by LOTR.